Has the hoax now moved from the sideshow to take the center stage of American culture?Award-winning poet and critic Kevin Young tours us through a rogue’s gallery of hoaxers, plagiarists, forgers, and fakers?from the humbug of P. T. Barnum and Edgar Allan Poe to the unrepentant bunk of JT LeRoy and Donald J. Trump. Bunk traces the history of the hoax as a peculiarly American phenomenon, examining what motivates hucksters and makes the rest of us so gullible. Disturbingly, Young finds that fakery is woven from stereotype and suspicion, race being the most insidious American hoax of all. He chronicles how Barnum came to fame by displaying figures like Joice Heth, a black woman whom he pretended was the 161-year-old nursemaid to George Washington, and What Is It?, an African American man Barnum professed was a newly discovered missing link in evolution. Bunk then turns to the hoaxing of history and the ways that forgers, plagiarists, and journalistic fakers invent backstories and falsehoods to sell us lies about themselves and about the world in our own time, from pretend Native Americans Grey Owl and Nasdijj to the deadly imposture of Clark Rockefeller, from the made-up memoirs of James Frey to the identity theft of Rachel Dolezal. In this brilliant and timely work, Young asks what it means to live in a post-factual world of “truthiness” where everything is up for interpretation and everyone is subject to a pervasive cynicism that damages our ideas of reality, fact, and art. 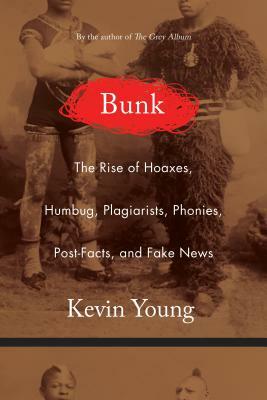 Tell us what do you think about Bunk: The Rise of Hoaxes, Humbug, Plagiarists, Phonies, Post-Facts, and Fake News.